Rosie Valencia, a student at Sequoia High School in Redwood City, interviews Facebook CEO Mark Zuckerberg Thursday about his career, future Facebook projects and why technology should be important to students. Watch the 20-minute conversation on PaloAltoOnline.com. Photo by My Nguyen. Sequoia High School students and staff were treated to a surprise visit by Facebook founder and CEO Mark Zuckerberg at a special assembly at the school in Redwood City on Wednesday, Sept. 18. Before Zuckerberg made his guest appearance, Facebook CIO Tim Campos announced that the social media company would be funding a mobile-application development class at Sequoia, where students will learn the elements of programming and design needed to build apps. Campos presented the school with 50 new Apple laptops to help equip the new class. "Part of how I got to where I am in my career is I started playing with technology when I was your guys' age," Campos said. "My dad worked at a university and his lab used technology a lot, so occasionally he would bring it home to work on and that exposed me to technology. "Imagine in today's world if, say, a football player like Colin Kaepernick couldn't play high school football, would he be as amazing of an athlete as he is today?" Campos said. "For the next generation of technology leaders, we need to make sure everyone has access to technology." Campos went on to answer students' questions about what it is like to work at Facebook, why Facebook is so successful, what the company is working on in terms of future projects and how much he gets paid, to which he answered, "Technology is a good industry to be in." "I want to inspire you," he said. "Look at what is going around you. ... Technology is changing everything in terms of how the world is working. It's an incredible opportunity to be apart of." Sequoia junior and former Facebook intern Rosie Valencia interviewed Zuckerberg about the importance of science, engineering and math education, and why technology is so important for students. The simplest answer, Zuckerberg said, is that technology is where all the jobs will be in the future. "If you look at history, the world evolves, and the jobs that people have evolve, and even some basic things like how you watch TV ... and the nature of cars (evolve)," he said. "Technology is playing a bigger role in all of these things, so the reality is if you want to have a better chance of getting a job ... and if you want to get a job that pays more, then being proficient in technology and knowing some basic things about how to use computers and use basic programming ... is going to be really critical to having a lot of options and doing what you want in the future." Facebook is a big company and serves a lot of people, Zuckerberg said, but his main focus is to help people through engineering and building products. "More than a billion people use Facebook, so one of the hardest jobs that we have is that out of all the different things that we can be working on on a day-to-day basis we need to make sure that we focus on the right things," he said. "There are certain things that can help the most people." Valencia, who participated in the 2014 Facebook Academy internship program, developed a mobile app that placed top-20 in a worldwide Technovation competition. Valencia said she learned that the company's purpose is to connect the world. She asked Zuckerberg why it is important to increase access to the Internet. A majority of people in the world don't have Internet access, so there are fewer ideas and tools the rest of us don't get exposed to because people without the Internet can't share their experiences, Zuckerberg said. "One way -- over time -- to create more peace and connectedness and a more functioning kind of world is to make sure everyone is exposed to all these different things (available online)," he said. Zuckerberg encouraged students interested in engineering and computer science to work hard. He said that learning about technology is a process like anything else. "So dive in and start and understand that you will not be amazing at everything immediately, but you just keep on pushing to get better," he said. 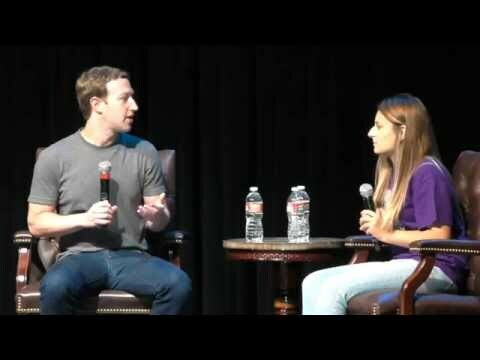 A video of the Q&A with Mark Zuckerberg is available on Palo Alto Online's YouTube channel. Nice gesture. I'd like to see this mobile app development class in all the High Schools, not just one. A mobile apps class for our students in PAUSD would be fantastic. Speaking of mobile...I'd like to see his security people stop harassing drivers near his house. "The simplest answer, Zuckerberg said, is that technology is where all the jobs will be in the future." Is this concerning to anybody else but me? If technology overtakes jobs such as teachers, social workers, therapists, artists, construction workers, doctors, nurses...society is in trouble. Maybe what he means is high-paying jobs will be in technology. Still concerning. STEM is important, but I do not think it is more important than humanities. I sometimes find the technology obsession of the Bay Area difficult to handle. If Mark Zuckerberg really want to make a difference, he should start with the portion of the Ravenswood School District that serves East Palo Alto children!! Zuckerberg has helped in East Palo Alto. $1 million to Ravenswood District this year is a great beginning, with the promise of more to come. I had a group of Ravenswood 6th grade girls who also developed their own mobile App last year for the Technovation Challenge, and there were groups at other schools in EPA, too, doing the same. They loved it and keep asking me when we can do it again! We will this year for sure. May I RESPECTFULLY suggest to consider linking this thread to "Schools & Kids" or any other category? Currently, this thread is linked to "Crimes & Incidents". Kudos for anyone giving money to Calif. schools. With that said, it's a sad state when our students are presented with billionaires who create social networking platforms for pushing ads down our throats as role models. It's a shame schools don't put as much effort and PR into introducing kids to scientists who are researching life saving cures, or genius grant award winners, or mathematicians who create real world solutions, wonderful authors or artists, or anyone who does anything substantive and meaningful - which is not Facebook. The economy is uncertain, Facebook is a huge fad, but who knows where it will be a few years from now. Maybe people will get sick of the privacy intrusion and throw it out. It could become a celebrity toy. Maybe we will even be able to reclaim the valuable notion of a "friend." Wonder if this man, M. Zuckerberg, is going to encourage students to go to college, and complete their degrees? Or is he going to point to himself as a model of how "tech" can make you very rich, without having to understand much about the world, as one might learn from an earned college degree?